Around 4,000 homes were flooded by the Souris River over the summer. This caused over two meters of water on the homes’ main floor for around three weeks in Minot, North Dakota. Around 2,300 trailers were moved to the area by the Federal Emergency Management Agency (FEMA), housing a lot of the 11,000 displaced people. And snowbirds have been lending out their homes to help the situation as well. Churches, schools, golf courses and other public places have also been destroyed. Indeed, it is anticipated that the Roosevelt Park Zoo will not reopen for around two to three years. Despite all this, spirits are up in the area. Signs reading “I’m Coming Back!” have been put on the front lawns of these destroyed homes. 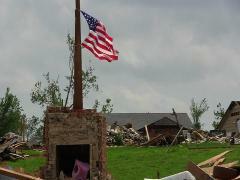 As well, the people of Minot are doing their utmost to help out their friends in the neighborhood. In Winnipeg for example, Church of Latter Day Saints and Mennonite Disaster Service (MDS) volunteers have been assisting the homeowners in rebuilding their properties. And things aren’t exactly quiet and peaceful for the MDS themselves, as they have been encountering a severe lack in donations which has led to some redundancies and pay drops for their staff. And, to add insult to injury, they are getting half of what they used to get in travel expenses. Clearly though, this attitude is showing how no matter what is going on in one’s personal life, when mass disaster strikes, everyone comes together to help out. At least, that is certainly the case in Minot right now.